The USBLS just released their Mid-Year Update of the Consumer Expenditure Survey covering the period 7/1/2014 to 6/30/2015. The following charts and observations on Pet Food Spending were prepared from calculations based upon data from that report and earlier ones. 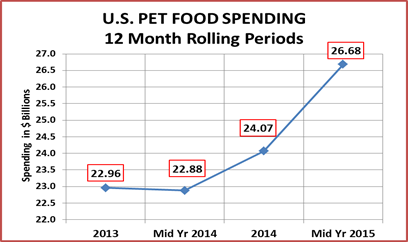 The most recent report shows Pet Food Annual spending at $26.68 B. (Food & Treats). The first chart will help put that into perspective with recent history. H/H’s increased 1.4M (1.1%), but Pet Food Spending per H/H increased 15.4%…Still a big number! There was a period of minor price deflation beginning in December 2013 and continuing through May of 2014 which could be a factor in the 2014 first half drop of -$0.09B. Question: Prices had a record plunge in July ’15. What will be the impact on $? We’ll know in September. The growth is being driven by the old and young…especially 55>64 and 25>34. However there is significant growth in the <35 group (Millennials) and the 55>74 group (Mostly Boomers). One big factor in the small decrease in the 45>54 age group is that there are 267,000 fewer households. There are 600K more >75 H/H’s. This may indicate that 75+ is the threshold for declining pet ownership. When you look at the under/over $70K groups, there has been a turnaround. 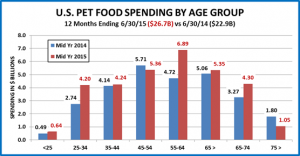 The over $70K group now accounts for more than 50% of Pet Food spending. They are only 34.8% of U.S. Households. There was strong growth in all the over $30K groups – ranging from 19 to 25%. Single Parents, Retirees, the Under 25 age group and many other lower income demographics were all showing increased Pet Food Spending, which undoubtedly helped to mitigate the overall drop in spending by the H/H’s with less than $30K in gross income. It is not a good idea to rush to judgment without a more in depth review, but the question of low or declining pet ownership among the elderly and African Americans has come up numerous times before and merits a closer look. This report is quite frankly great news for the industry. 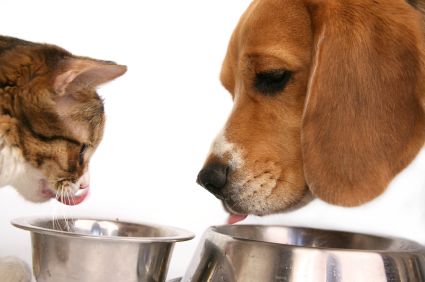 If you have a Pet, you invariably buy Pet Food. Increased Pet Food spending may reflect the movement to more premium foods but it also is an excellent indicator that the number of U.S. pet households is strong and growing. In an earlier post on Pet Products we noted that our spending on Pet Food & Supplies showed a 50 year commitment to our pets – from age 25 to 75. With this report, we saw a 30.6% increase in Pet Food Spending from the Under 25 age group. Admittedly, their spending numbers are still small. However, they are moving up – quickly. I’m sure that you’ll all join me in welcoming these young Millennials aboard the “Pet Parent Express”. We know that they will enjoy it and it’s a ride that lasts a lifetime!